As a hierarch and venerable of the Lord. Our Venerable Father Theodosios was born in the village of Korisos, near Kastoria, to virtuous parents who made their living through farming. He was the older brother of Saint Dionysios (June 25), who later became the founder of Dionysiou Monastery on Mount Athos. When Theodosios was eighteen and Dionysios was still a child, he went to Constantinople in search of virtuous men to benefit from their words and by their example. There he stayed at the Ecumenical Patriarchate, where there were monks who excelled in chanting and asceticism. There he received a well-rounded education, both secular and sacred. Because he was revered by all and acquired all the virtues, the Patriarch ordained him Deacon and then Presbyter. Shortly after this Theodosios departed Constantinople for the Holy Mountain of Athos, where he visited all the cells and monasteries. Yet, it was at the Monastery of Philotheou that he decided to dedicate himself to prayer and obedience. In a short time, Theodosios outshone all the monks in virtue and zeal. For this reason, when the abbot died, the fathers of the monastery besought Theodosios to accept the abbacy. Though unwilling at first, he chose to be obedient and was made abbot. Soon his fame spread, and many came to the Holy Mountain and Philotheou specifically to receive his blessing and advice in spiritual matters. When news reached his younger brother Dionysios that Theodosios was the abbot of Philotheou, having come of age and able to grow a beard, he immediately set off for the Holy Mountain and joined the brotherhood of Philotheou. Soon after Theodosios tonsured Dionysios a monk, and the local Bishop ordained him Deacon and Presbyter. After living a life of extreme asceticism and having acquired the virtues, he set off for a more secluded area, and eventually established the Skete of the Holy Forerunner. As for Theodosios, one day, as the Feast of the Annunciation was fast approaching, he went down to the shore with others to fish. As they were fishing by night, certain Turkish pirate captured them and brought the monks to Prousa to sell them. There were certain Christians in the city, who upon seeing they were monks, purchased them and then immediately set them free. The others decided to return to their monastery, but Theodosios decided to go to Constantinople. When he met Patriarch Philotheos (1364-1376), who was impressed by him and delighted in him, he appointed him abbot of the Monastery of Manganon. Not long after this, the Metropolitan of Trebizond died, and Emperor Alexios III Komnenos of Trebizond (1349-1390) requested of the Patriarch a worthy holy man and ordain him the Metropolitan of Trebizond. The Patriarch chose Theodosios, although Theodosios did not desire the dignity, and he was consecrated Metropolitan of Trebizond in 1368/9. Soon after his brother Dionysios joined him, though his main purpose was to acquire the necessary funds to build a monastery on the Holy Mountain. Theodosios promised to help his brother, and they both paid homage to the emperor Alexios for this purpose. The emperor therefore decided to fulfill their request, as long as the monastery ever commemorate him together with all his ancestors and descendants in the services and liturgies, that they may be eternally blessed. Dionysios promised the emperor that he would indeed do so, and a chrysobull was published in September of 1374, the necessary funds were provided, and the icon of the Panagia of the Akathist was presented as a gift. And though the emperor desired for the monastery to be known as the Monastery of the Great Komnenos, the name never stuck and took on the name of its founder instead and was called Dionysiou. After Dionysiou Monastery was built in 1380, there was still much work to be done and additional funding was needed. Therefore Dionysios returned to Trebizond again, where he was given what was needed from the emperor. But when he returned again to his monastery on the Holy Mountain, he found it to be pillaged by the Turkish pirates and the monks were taken as slaves. When he returned to Trebizond to present the misfortune to his brother and the emperor, and being assured help of restoring the monastery with the ransomed monks from slavery, he reposed in the Lord on June 25, 1389. His brother interred his relics in the Church of Chrysokephalos, and they became a source of many miracles. 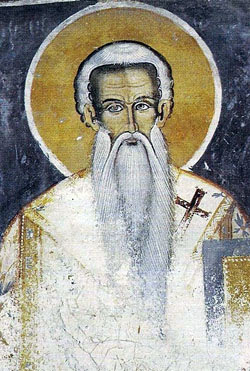 A few years later, in 1392, Saint Theodosios also reposed in peace at Trebizond.